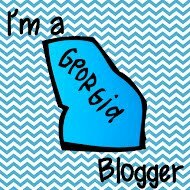 If you haven't heard, Teaching Blog Addict, TBA, is undergoing some changes that I think will be a win-win for all involved! This week, TBA's hosting Open House Week. Each day has a theme or topic. Monday's topic is Meet the Teacher. My name is Michelle Lundy. I just celebrated my 42nd birthday and have no qualms about sharing my age! I live in a small town in Georgia and teach in a slightly larger small town in Georgia. I've been teaching 7 years. I worked for the Georgia State Patrol before returning to college for a new degree. I'm highly qualified to teach all content areas to grades 4 - 8. However, Math is my absolute passion. I did teach Science last year due to another teacher leaving our school. I also teach one class of Social Studies since I'm on a 4-member teaching team. The gifted and honors students at my school are served in every subject throughout the day, but they get further enrichment during what we call ELT, Extended Learning Time. I teach the that class as well. I've taught 6th, 7th, & 8th, but 5 of my years have been in 7th grade. They are a special breed all their own and you can't help but love them! We have around 1,200 students at my school. We are Title 1, mostly free and reduced, in a very low socio-economic setting. I LOVE what I do and I LOVE my students! If I didn't, I couldn't go back day-after-day! On a personal note, I married my high school sweetheart over 22 years ago while he was in the Marine Corps. We have 3 sons aged 18, 19, and 21! I love pets and we have a mini zoo at my house. Four dogs, a cat, a chinchilla, and of course, my classroom pet turtle. As for my teaching style, I don't like boring! I want my students to come in and feel comfortable and safe while knowing they can have a little fun as well. I love to use technology every chance I get. My students work in pairs or groups almost daily. While I try to incorporate as many current best practices as I can, I believe there are still some good strategies from the past that should still have a place in the classroom! I love organization, routines, and procedures in my classroom, as well as in my every day life! Sometimes it takes a while for all my 120+ students to realize the importance of this, but when they get it, they realize how much time it saves and how they know exactly what to do and where to put things even if I'm not there! I tell them, "There is method in my madness." How would you describe your teaching style? I'd love to read a comment about you! 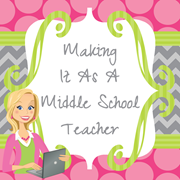 Head over to TBA to see more Meet the Teacher posts! Hey Michelle! Great blog (the colors were my wedding colors so I'm partial). I bet your class is a blast because your posts are so high energy! I teach 7th and 8th at a private school in Texas. I started out teaching English at a charter school and teach religion classes now. I am so with you on procedures! My students think it's crazy the first few weeks of class, but once they have it down, it saves so much time and stress all around! Anyway, I'm following you now, so I can't wait for the next post! Thanks for the great stuff!